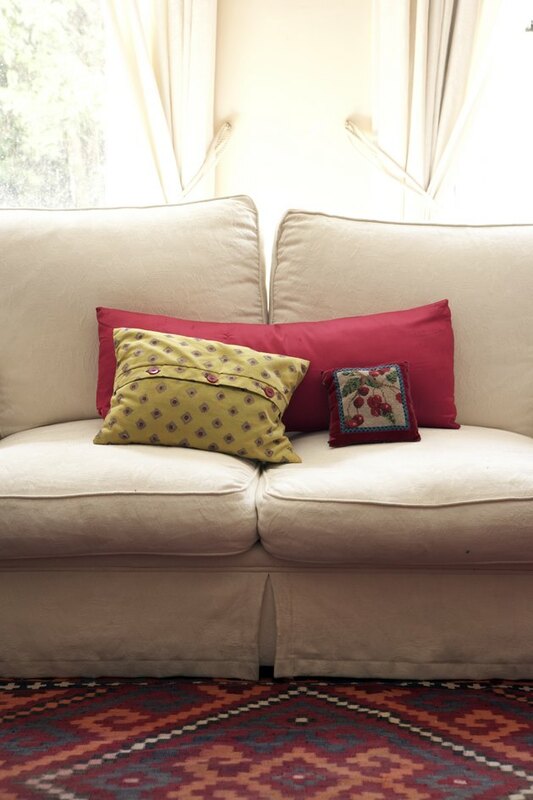 Reupholstering an old couch is typically a simple task, unless the couch has an attached top cushion. The cushion stays affixed to the couch and acts as a lumpy road block to smooth perfection. Viewing the couch as different components makes reupholstering the sofa an easier task. Instead of trying to make one large slipcover that wraps around the entire piece, work on each component separately, and then bring the pieces together. With a single-cushion couch, you must work around the cushion. Look over the couch carefully, identifying seams or metal staples attaching the fabric to the couch frame. Remove the staples with a pair of pliers by sliding the edge of the pliers under the metal and pulling up. For seams, run the utility knife across the fabric, cutting through the seams. Remove the fabric pieces from the couch and place on a flat surface. Measure the size of each piece and add at least 1 inch to all measurements. Purchase new fabric and cut to the same size as your measurements. Wrap the largest piece of fabric around the fixed cushion. Push the fabric behind the cushion and down into the frame. Lift the front of the cushion and tuck the fabric underneath. Press the fabric against the wood frame and use a staple gun on the fabric, attaching it to the frame. Cover the rest of the couch with the remaining pieces of fabric. With each piece, tuck one side behind or under the cushion. Attach the other end to the frame with the staple gun. Smooth the fabric down with your hands, making it sit flat against the couch. Turn the couch upside down and examine the bottom. The couch should either open to the frame or have fabric covering the frame. If it has a fabric covering, remove the staples with the pliers and set the fabric to one side. Find the fabric you pushed inside the couch and lay it flat against the frame. Staple the fabric to the frame, using staples on every piece of fabric. Cover the bottom with the piece of fabric you removed and staple in place. When you turn the couch back over, the fabric should sit smoothly on the couch.